The above graphic, included in the recent Copenhagen Diagnosis, illustrates this situation nicely. The graphic shows three different pathways, each of which would give humanity a 75% chance of limiting warming to 2°C – a target that has been widely endorsed by governments, including those of the UK and EU. 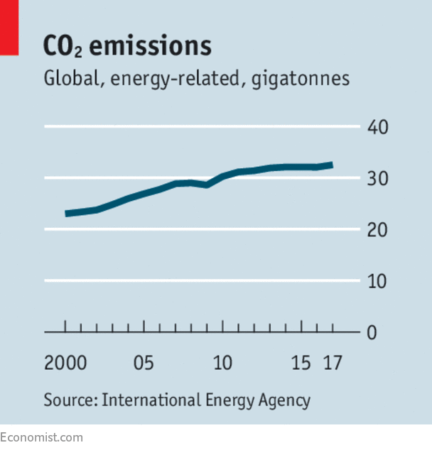 In a scenario where global emissions peak in 2011, they would only need to fall to about 5 gigatonnes by 2050, a reduction rate of 3.7% per year. Waiting just four more years, and having them peak in 2015, increases that to 5.3% per year. 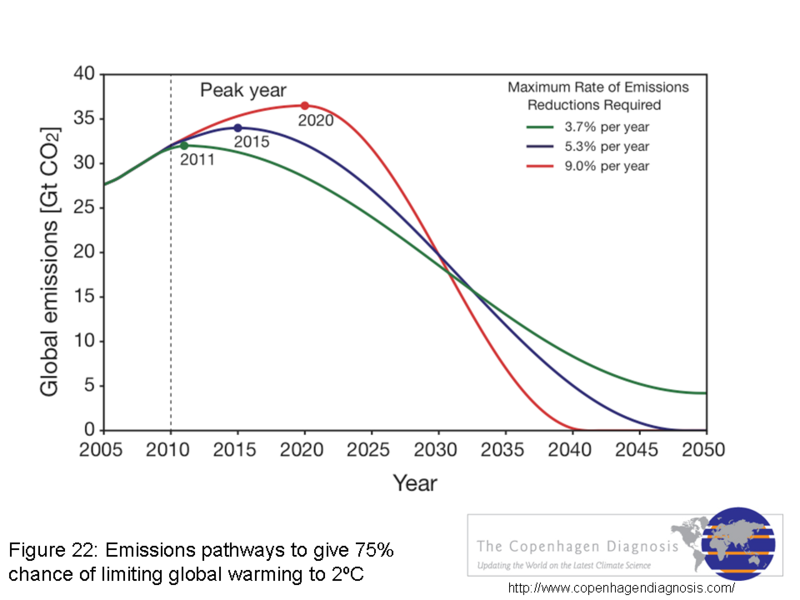 In the scenario with the 2015 peak, humanity as a whole needs to be carbon neutral before 2050, in order to provide the 75% certainty of avoiding more than 2°C of warming. Waiting until 2020 means that emissions need to fall by 9% per year afterwards, with carbon neutrality reached around 2040. Bear in mind that these are global pathways. Under a contraction and convergence approach, where countries cut emissions while simultaneously becoming more equal in terms of per capita emissions, Canada would need to cut even faster. This illustrates firstly how wrongheaded it is to hope for a few more years of a hydrocarbon boom before we start the process of adjustment. It also illustrates the urgency of getting an effective global agreement in place soon. This isn’t an issue on which we can simply doddle for a decade. If we don’t want to see our children living in a transformed world, humanity needs to act fast and on a massive scale. On a personal level, this may also bring some clarity to the many discussions we’ve had here about carbon ethics. If we individually want to mirror what the world as a whole needs to do, we should be planning to have our personal emissions peak virtually instantly, and fall every year thereafter. People who are my age should be thinking seriously about the possibility of living carbon-neutral lives by the time they face retirement – and about what accomplishing that would require. If we individually want to mirror what the world as a whole needs to do, we should be planning to have our personal emissions peak virtually instantly, and fall every year thereafter. As you said before, dealing with climate change is like changing the course of a huge cruise ship. What is important now is altering the overall direction, not changing the individual lifestyle choices of activists. Besides, it is impossible for the world’s current six billion people to go carbon neutral without enormous changes in infrastructure. Those curves are still sobering, however. It doesn’t seem like anyone has the will to start on the first part of the green curve – and it is hard to imagine what the middle of the red curve would be like. “The problem is not a technological one. The human race has almost all the tools it needs to continue leading much the sort of life it has been enjoying without causing a net increase in greenhouse-gas concentrations in the atmosphere. Industrial and agricultural processes can be changed. Electricity can be produced by wind, sunlight, biomass or nuclear reactors, and cars can be powered by biofuels and electricity. Biofuel engines for aircraft still need some work before they are suitable for long-haul flights, but should be available soon. It is all about politics. Climate change is the hardest political problem the world has ever had to deal with. It is a prisoner’s dilemma, a free-rider problem and the tragedy of the commons all rolled into one. At issue is the difficulty of allocating the cost of collective action and trusting other parties to bear their share of the burden. At a city, state and national level, institutions that can resolve such problems have been built up over the centuries. But climate change has been a worldwide worry for only a couple of decades. Mankind has no framework for it. The UN is a useful talking shop, but it does not get much done. “Until Copenhagen, the aim was to set targets for major emitters of greenhouse gases that would limit warming to 2 °C. That required, as a first step, that by 2020 industrialised countries cut emissions by 25 to 40 per cent compared with 1990 levels. While that target remains an option in draft deals, most negotiators say they will have to accept whatever pledges industrialised countries are prepared to make. Right now those pledges add up to cuts of between 12 and 19 per cent, according to the UN climate secretariat. And there are loopholes that could mean even these pledges amount to virtually nothing. The IEA also looked at what it might take to hit a two-degree target; the answer, says the agency’s chief economist, Fatih Birol, is “too good to be believed”. Every signatory of the Copenhagen accord would have to hit the top of its range of commitments. That would provide a worldwide rate of decarbonisation (reduction in carbon emitted per unit of GDP) twice as large in the decade to come as in the one just past: 2.8% a year, not 1.4%. Mr Birol notes that the highest annual rate on record is 2.5%, in the wake of the first oil shock. The promises countries have made to control carbon emissions will see temperatures rise by up to 4C during this century, a UN report concludes. The report, from the UN Environment Programme (Unep), comes days before the opening of this year’s climate summit. It concludes there is a significant gap between what science says is necessary to constrain temperature rise and what governments have pledged to achieve. But with extra political will, it says, warming could be kept much lower. On Sunday, scientists released data showing that the recession curbed emissions from fossil-fuel burning by only 1.3% during 2009, and that they are set to begin rising again as the global economy cranks up once more. Unep’s analysis shows that even if governments implement all they have pledged to do, that would “…imply a temperature increase of between 2.5-5C [from pre-industrial times] before the end of the century”. Davis, S.J., K. Caldeira, and H.D. Matthews. 2010. Future CO2 emissions and climate change from existing energy infrastructure. Science 10 September, 2010 Vol 328 pp 1330-1333. The long lifetime of existing transportation and energy infrastructure means that continued emissions of CO2 from these sources are likely for a number of decades. This ‘infrastructural inertia’ alone is projected to produce a warming commitment of 1.3°C above the pre-industrial era. This result emphasizes that extraordinary measures will be required to limit emissions from new energy and transportation sources if global temperature is to be stabilized below 2°C. Climate modeling has demonstrated that even if atmospheric composition was fixed at current levels, continued warming of the climate would occur due to inertia in the climate system. This form of climate change commitment has become widely recognized. Davis et al. focus attention on inertia in human systems, by asking ‘what CO2 levels and global mean temperature would be attained if no additional CO2-emitting devices (e.g., power plants, motor vehicles) were built but all the existing CO2-emitting devices were allowed to live out their normal lifetimes?”. Barring widespread retrofitting or early decommissioning of existing infrastructure, these committed emissions represent ‘infrastructural inertia’. The authors developed scenarios of global CO2 emissions from existing infrastructure directly emitting CO2 to the atmosphere for the period 2010 to 2060 (with emissions approaching zero at the end of this time period) and used the University of Victoria Earth System Climate Model to project the resulting changes in atmospheric CO2 and global mean temperature. Projections with low, mid and high emissions scenarios led to projected global average warming of 1.3°C (1.1° to 1.4°C) above the pre-industrial era. Since new sources of CO2 are bound to be built in the future in order to satisfy growing demands for energy and transportation, the committed warming from existing infrastructure makes clear that satisfying these demands and achieving the 2°C target of the Copenhagen Accord will be an enormous challenge. In engagements with young people in particular, I like to introduce the notion that, “We are the U-turn Generation.” The concept is this: all of us who have the courage to look the science of global warming full-on wrestle with despair. A clear understanding of what the scientific studies are telling us is that wealthy industrialized societies must be carbon-zero by 2050. Even then, we will still face the challenge of pulling accumulated GHGs out of the atmosphere, in order to get global CO2 parts per million (PPM) down to 350, if devastating ecological and social upheaval and harm is to be avoided. We are forced to live with the uncertainty of whether this Herculean global task can be accomplished. But for now, the task of this generation is the U-turn ­­– to change the direction of the path we are on – to see global emissions slow, and over the next 30-40 years, drop to zero. Under the Paris deal, each country put forward a proposal to curtail its greenhouse-gas emissions between now and 2030. But no major industrialized country is currently on track to fulfill its pledge, according to new data from the Climate Action Tracker. Not the European Union. Not Canada. Not Japan. And not the United States, which under President Trump is still planning to leave the Paris agreement by 2020. This year’s “Emissions Gap” report from the UN, published in October, shows that the first set of climate pledges submitted by 164 countries corresponds to barely a third of the cut in emissions needed to keep warming below 2°C (see chart). Studies suggest that these “nationally determined contributions” (NDCs) would probably result in temperatures 2.9-3.4°C higher than in pre-industrial times—and that only if they are fully implemented, which seems unlikely. Electricity also rewards co-operation. Because renewables are intermittent, regional grids are needed to ship electricity from where it is plentiful to where it is not. This could replicate the pipeline politics that Russia engages in with its natural-gas shipments to Europe. More likely, as grids are interconnected so as to diversify supply, more interdependent countries will conclude that manipulating the market is self-defeating. After all, unlike gas, you cannot keep electricity in the ground. An electric world is therefore desirable. But getting there will be hard, for two reasons. First, as rents dry up, authoritarian oil-dependent governments could collapse. Few will miss them, but their passing could cause social unrest and strife. Oil producers had a taste of what is to come when the price plunged in 2014-16, which led to deep, and unpopular, austerity measures. Saudi Arabia and Russia have temporarily stopped the rot by curtailing production and pushing oil prices higher, as part of an “OPEC+” agreement. They need high prices to buy time to wean their economies off oil. But the higher the oil price, the greater the incentive for energy-thirsty behemoths like China and India to invest in renewable-powered electrification to give themselves cheaper and more secure supplies. Should the producers’ alliance crumble in the face of a long-term decline in demand for oil, prices could once again tumble, this time for good. That will lead to the second danger: the fallout for investors in oil assets. America’s frackers need only look at the country’s woebegone coalminers to catch a glimpse of their fate in a distant post-oil future. The International Energy Agency, a forecaster, reckons that, if action to limit global warming to below 2°C accelerates in coming years, $1trn of oil assets could be stranded, ie, rendered obsolete. If the transition is unexpectedly sudden, stockmarkets will be dangerously exposed. 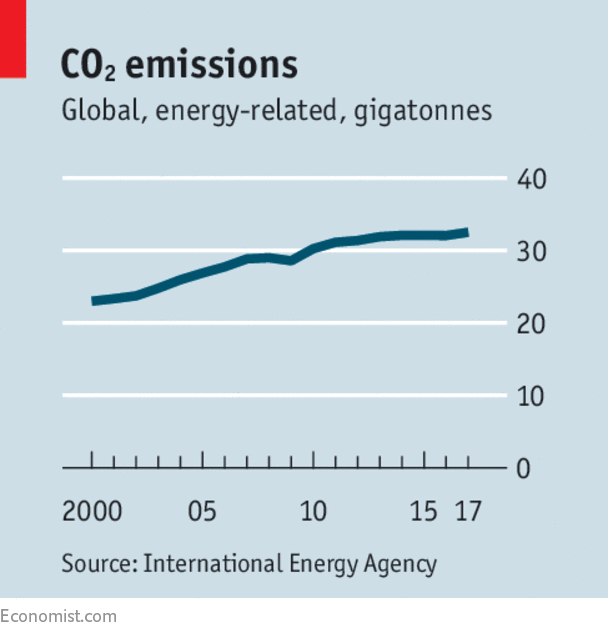 Global energy-related carbon-dioxide emissions grew by 1.4% last year, according to the International Energy Agency, to a record 32.5 gigatonnes. 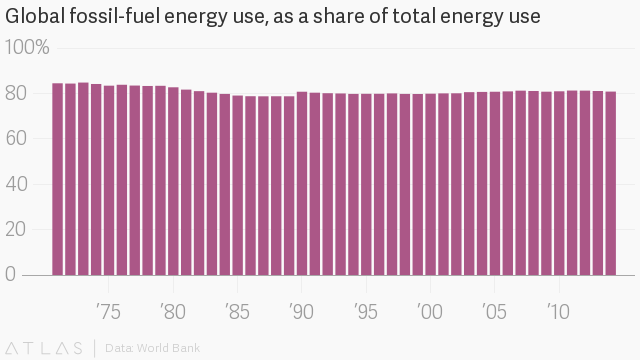 Some big economies, such as America and Japan, saw their emissions decrease; Britain’s fell by 3.8%. Asian countries accounted for two-thirds of the global increase. Despite the growth in renewables, the share of fossil fuels in the world’s energy mix remains at 81%, the same level it has been for three decades. Human activities are currently emitting about 42bn tonnes of carbon dioxide every year, and at that rate the carbon budget – allowing us a 50-50 chance of keeping warming to 1.5C – would be exhausted within 20 years. Net zero emissions are the end goal, because that is the ONLY way to stabilize atmospheric concentrations as per the original UNFCCC (1992). How fast we reach net zero determines how much warming we see. What might turn the tide?